When I mention to friends that I still watch and very much enjoy WWE and pro wrestling, I get the snide remark of "you know it's fake right?" This used to drive me crazy, but I just shake it off and say, "you know that Game of Thrones is fake right?" Professional wrestling is entertainment and a great show. It's a mix of stage theatrics and pure athleticism that I will never achieve in my lifetime. There are many independent wrestling organizations throughout the country, but Chicago is home to a local organization, Freelance Wrestling. Nick Almendurez wears many hats for Freelance. He is the founder, owner, matchmaker, social media guru and even a talent, going by the ring name Marvelous Matt Knicks, who is part of the tag team the Four Star Heroes with Chris Castro. 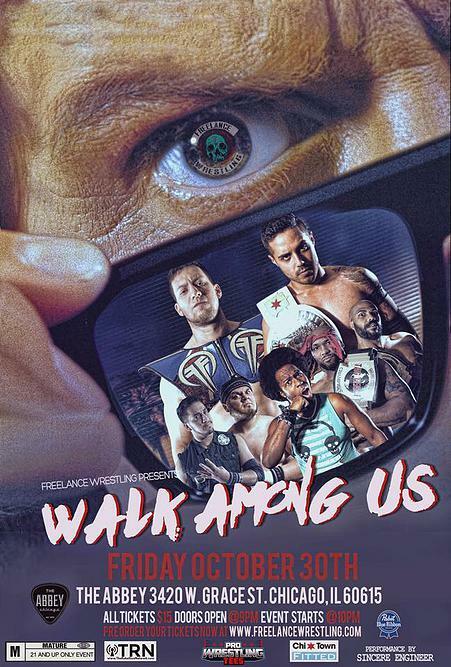 Freelance has a show coming up on Friday, October 30 at The Abbey Pub, "Walk Among Us". Almendurez was nice enough to chat with me to give an insight into how a wrestling show is set up and what fans can expect to see on the 30th. Can you tell a little bit how Freelance Wrestling got its start? Not many people know that the original idea for Freelance was to do something similar to what Beyond Wrestling was doing. They're based out of the East Coast and their shows were intended for the wrestlers, performed by the wrestlers and there was no crowds in the arena and the shows were just filmed for YouTube. I was thinking to do something similar like that in the Midwest for guys who couldn't make it out that far. At that time, we had did one show like that around 2013 but Beyond started to do sleeper cells, shows similar to that in places like St. Louis and Florida, and that negated my idea. So we went back to the drawing board. I thought I want to do a live event with myself and a couple of my friends and do it to have fun. I didn't think it would make it past one show, so I asked wrestlers I liked to attend and our first show was June 27, 2014 at Abbey Pub. How did you get the word out about that first show? I did some hard promotion on that, hitting every neighborhood I could, hanging up flyers in coffee shops and anywhere I could. We had a decent crowd show up and people wanted to come out again and just said, screw it, let's do another show. So it seemed like you did more pop up shows at the beginning with just some cool matches booked. But now you guys are a bigger organization, did that change your overall storytelling of the shows and what type of matches you have? Once we got a grasp on what we wanted to do, we started injecting some story into it. We planted some story seeds into the first show, just in case this becomes something and we can build off of and not fly blindly in the night [for future shows]. You said that you are the booker (wrestling lingo for the person who decides the matches and their order), but do you have any other creative members on the team? A lot of the hard booking me and Jack [Edinger, co-booker and production manager for Freelance] will do. We'll usually talk through email or text throughout the weeks leading up to the shows, but usually the week of the show we'll meet together and put things down on paper of how we want the direction of the show to go. That way we have a good outline and we can present it to the roster. Something I like to do, which I'm sure other people like to do, is have the talent heavily involved in what they are doing. I feel like it's a little bit more organic, as opposed to telling people each step and they're reciting it and it doesn't feel real. I usually tell them, this is kinda what I'm thinking and kinda where I want it go, how do you want to get there. So we talk about it and figure out a way to do the story for them and the company. So a member of the roster will pitch you a story and you bounce back and forth ideas? Yeah pretty much. I think that's the most fun and when the guys in the ring are having fun, then the crowd is having fun. What can those who are attending or are thinking about attending expect for the show on Oct. 30th? It will be back at Abbey Pub and we have "The Ego" Robert Anthony finally meeting Isaias Velazquez for the Freelance Wrestling Championship. We'll also see a battle royale featuring "Stars of the 80's". Does that mean guys are going to dress up like old school wrestlers from the 80's? Yeah [laughs] Cause it's a halloween show we'll have a bunch of guys in costumes, which will make it a really great show. The event is being held Friday, October 30th at The Abbey Pub. Doors open at 9 pm and is scheduled to begin at 10 pm. Tickets are priced at $15 and can be found here.